Members of Pensacola State College’s AFC chapter masqueraded as Santa Claus for the First Judicial Circuit Guardian ad Litem Program during the holiday season. 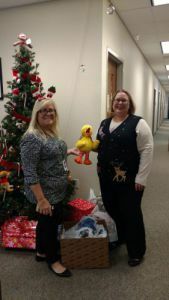 Association of Florida Colleges members purchased and donated about 40 new toys, assorted gift cards and more than $200 in cash to children in need throughout Escambia and Santa Rosa counties. Mel Miner, a Guardian ad Litem and AFC member, said the donations made a tremendous difference in the lives of the children in the program. “As an advocate for children, I know they were very excited about the presents. 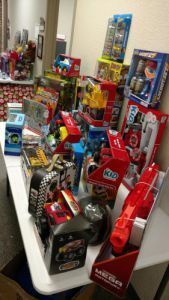 For me, it was heartwarming seeing the joy on their faces when they received the toys and other items,” Miner said. “I can’t thank the members of the AFC enough for their generosity.” Pictured are Miner and Joan Irby, Guardian ad Litem Recruitment Coordinator.